Advocates Staff and Girl Engagement Advisory Board Member Engage to Advance Girls’ Rights at the United Nations Post 2015 Inter Governmental Negotiations. Advocates’ staff and Christal, a member of Advocates’ Girl Engagement Advisory Board who lives in Jamaica, participated along with other civil society members in the recent Post 2015 Inter Governmental Negotiations that were held at the United Nations. While at the UN, they attended the Women’s Major Group and Major Group for Children and Youth meetings to strategize on how best to influence the final week of negotiations, attended side events and UN plenaries, and engaging in advocacy efforts to secure and sustain commitments and strong language supportive of girls’ rights. On July 2, Member States adopted by acclamation The 2030 Agenda for Sustainable Development. The agenda consists of four pillars: the Declaration; the Sustainable Development Goals and Targets; a chapter on Means of Implementation and Global Partnership; and a chapter on Follow-up and Review. The final Agenda is the culmination of a three-year process, reflecting a broad consensus and including strong commitments to gender equality and the human rights of women and girls. It will be formally adopted at the Post-2015 Summit next month and the Agenda will officially go into effect on January 1, 2016. While this is a tremendous achievement, there is still much work to be done to ensure effective implementation in order to realize the Agenda’s goals and targets by 2030. To read Christal’s blog where she describes some UN basics, offers an analysis of the 2030 Agenda for Sustainable Development, and describes her experience in New York, go here. Advocates Conducts Site Visit to Program Partner in Ghana. Advocates traveled to Accra, Ghana, to work with the Youth Development, Research and Innovation Centre (YOUDRIC),which is implementing Youth Reproductive Health Clubs in the Central Region of Ghana, in partnership with t Advocates for Youth. In March, YOUDRIC trained 30 teachers to facilitate the implementation of the Youth Reproductive Health Clubs, which are made up of 30 students in fifteen schools. Club members receive sexuality education that empowers them to understand their rights as well as to become peer educators and use a variety of approaches such as one-on-one mentoring, small group discussions, and drama performances to provide sexual and reproductive health education and referrals to services to their peers at school. Advocates is also working to build YODRIC’s capacity to be inclusive of LGBTQ youth and provided training to fourteen YOUDRIC staff to build knowledge about how to effectively work with LGBTQ youth and related sexual and reproductive heath issues and terminology. Regional Sexuality Education Lesson Plans for East and Southern Africa on the Road to Piloting. About nine months ago Advocates for Youth, in partnership with UNESCO and UNFPA, initiated a process within a broader effort to support the implementation of sexuality education in East and Southern Africa, to develop a set of scripted sexuality education lesson plans for use and further adaptation within the region. In November of 2014, UNESCO and UNFPA hosted the Regional Consultative Meeting to Support the Development of Sexuality Education Lesson Plans in Johannesburg, South Africa, which was facilitated by Advocates for Youth. During this consultation, delegates representing 10 countries including curriculum developers, education stakeholders, and teachers helped identify gaps in existing life skills and sexuality education curricula and materials and prioritize topics for a regional resource of individual scripted lesson plans. An Advisory Board was also established at the consultation, whose members reviewed and provided inputs to the lesson plans that Advocates drafted over the subsequent months. To date, some of the lesson plans have also been informed by inputs provided by participants during a regional training of trainers for pre-service teacher training that Advocates conducted with UNESCO and UNFPA this past June in South Africa. Currently, we are excited to share that three countries in the region are moving forward to pilot the lesson plans, including Lesotho, Namibia, and Rwanda. Stay tuned for updates! What do you think needs to be prioritized in the next set of global goals? How can youth be leaders of change in the next 15 years? Then, post your video on Instagram and tag your video with the hashtag #YouthVoices or send your video to info@girlsglobe.org and they will post it for you on the @GirlsGlobe Instagram account. Attention Leaders in Commonwealth Countries–Engage in the #WhatNext Social Media Campaign and/or the Out of the Blue Photography Competition. This campaign calls for young people and youth workers in Commonwealth countries (check countries here.) to share messages about what next they would like to see in terms of young people development and empowerment, in the lead up the 2015 Commonwealth Heads of Government Meeting this November. One way to engage is to take a photo with a message written inside the #WhatNext sign and publish the photo with your key message to the world and by using the #WhatNext hashtag. The best messages will win a trip to the 10th Commonwealth Youth Forum (CYF10), taking place this November in Malta. Out of the Blue is a photography competition on oceans designed to showcase the wonder and value of the Commonwealth’s oceans and the human life that oceans support. The competition hopes to inspire the citizens and leaders of the Commonwealth to take rapid action to safeguard the oceans. Prizes include attending the 2015 Commonwealth Heads of Government Meeting and the 10th Commonwealth Youth Forum . Apply for Funding from FRIDA in Support of Global Young Feminist Activism. FRIDA | The Young Feminist Fund is the only youth-led fund focused exclusively on supporting global young feminist activism to advance social justice movements and agendas. FRIDA was created to bring new resources and new opportunities to young women and trans* youth globally. This is the forth call for proposals intended to support up to 30 new young feminist groups led by young women and trans* youth under 30 years of age. FRIDA makes grants of up to $5,000 USD. They are flexible grants that can be used for general support and/or projects to be used over a period of 12 months and are open to renewal. Applicants that meet FRIDA’s criteria must vote for their top proposal choices in their region and give comments on their selections (groups may not vote for their own proposals). Applicants vote anonymously, based on the summary of each application from their region. The deadline for applications is September 14, 2015. For more information, go here. You Can Still Apply for Movies the Matter Small Grants. Are you planning to organize a festival or event with human rights films in Africa, Asia, Eastern Europe, Latin America or the Middle East? Movies that Matter offers small grants (up to EUR 7,500) to stage human rights film festivals and screenings in Africa, Asia, Eastern Europe, Latin America and the Middle East. The next deadline for applications is September 15, 2015. Adolescent Women’s Need for and Use of Sexual and Reproductive Health Services in Developing Countries By the Guttmacher Institute. This report examines a range of sexual and reproductive health indicators for women aged 15–19 across developing regions. Based on national health surveys and published research findings from 70 countries across Africa, Asia, and Latin America and the Caribbean, the report finds that many adolescent girls struggle to get the sexual and reproductive health information and services they need. The report looks at adolescent childbearing; early marriage; unmet need for contraception; sexual activity; STI services; and unsafe abortion. It also provides recommendations for policy and programmatic strategies that could significantly improve sexual and reproductive health services for adolescents in developing regions. Read the fact sheet (français, español) based on this report. Demographic Perspectives on Female Genital Mutilation. This report, the first such published by the United Nations Population Fund (UNFPA), looks at FGC/M through the lens of population dynamics and the demographic dividend.. It offers information that both supports evidence-based programming and frames financial implications for Member States and international donors. World Population Prospects: 2015 Revision By UN DESA’s Population Division. The 2015 Revision of World Population Prospects reveals that the global population is projected to reach 9.7 billion by 2050. This latest revision represents the twenty-fourth round of official United Nations population estimates and projections. Its main results are presented in a series of Excel files displaying key demographic indicators for each development group, income group, major area, region and country for selected periods or dates within 1950-2100. This comprehensive review of worldwide demographic trends and future prospects is essential for assessing the degree of progress made in achieving the Millennium Development Goals (MDGs) and to guide policies aimed at achieving the new post-2015 development agenda, which Member States will adopt this September. To access the key findings document, go here. To access data files, maps and graphs, go here. Transgender People and HIV By the World Health Organization. This technical brief summarizes essential information and existing WHO recommendations for HIV prevention, diagnosis, treatment and care among transgender populations. This is the first global WHO document to address HIV prevention, diagnosis, treatment care and needs of transgender people specifically. To access the policy brief, go here. The Vancouver Consensus: antiretroviral medicines, medical evidence, and political will. Following the 8th International AIDS Society Conference on HIV Pathogenesis, Treatment and Prevention (IAS 2015), more than 500 researchers, clinicians and others have signed on to the Vancouver Consensus statement calling for immediate access to antiretroviral treatment upon an HIV+ diagnosis. Convention on the Rights of Persons with Disabilities Optional Protocols and Signatures and Ratifications By United Nations Enable. 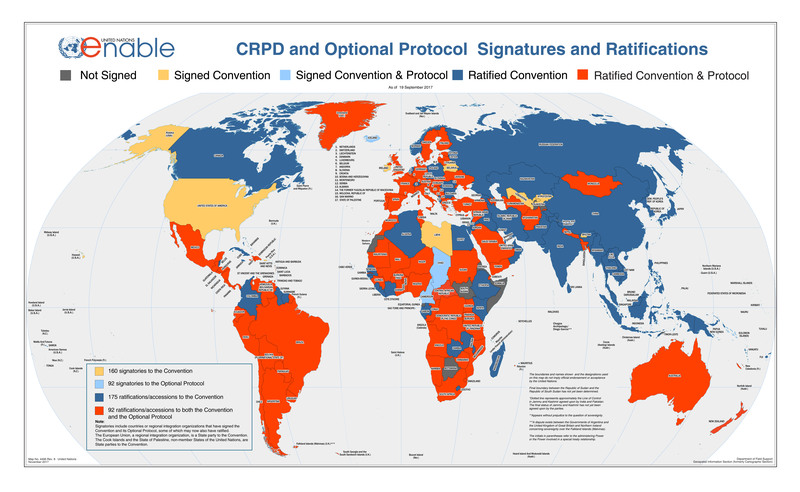 This interactive map is an excellent resource for viewing the status of signatures and ratifications of the Convention on the Rights of Persons Living with Disabilities. To access the map, go here. Reaching Young Married Women and First-time Parents for Healthy Timing and Spacing of Pregnancies in Burkina Faso By Pathfinder International. This technical brief discusses a project in Burkina Faso focused on promoting healthy timing and spacing of pregnancy through contraceptive use among young married women. It describes program implementation experiences and qualitative and monitoring documentation used to gather evidence on promising practices. Quality of Care and Contraceptive Use in Urban Kenya In International Perspectives on Sexual and Reproductive Health, Volume 41, Number 2, June 2015. This journal article reports findings from a study carried out in urban Kenya to determine whether the quality of family planning services affects her decision to use contraception. International Literacy Day, September 8, 2015. September 8 was proclaimed International Literacy Day by UNESCO on November 17, 1965. The purpose of this day is to highlight the importance of literacy to individuals, communities and societies. The theme for International Literacy Day 2015 is Literacy and Sustainable Societies. Literacy is a key driver for sustainable development and the foundation for acquiring knowledge, building skills, and developing and communicating one’s values. Literacy and sexual and reproductive health and rights are inherently connected, impacting young people’s lives and progress towards a more sustainable and equitable world. While literacy rates for adults and young people continue to rise with young women ages 15-24 making the strongest gains, adolescent girls and women still lag behind boys and young men. There are 126 million young people around the world who are illiterate, of which approximately 63% are girls and young women. Host a community event to raise awareness about the importance of literacy and access to quality education for both boys and girls. Engage with coalitions or organizations working in your community to advance young people’s rights to quality education, including sexuality education. Identify and request a meeting with community leaders and/or decision-makers to inform them about the importance of investing in young people’s education and ensuring that both boys and girls can read and write. Blog on Advocates’ youth activist website, amplifyyourvoice.org, and write about why you think International Literacy Day is important, how you and your peers are making a difference in your community, or what you think policy makers and leaders need to be doing to support literacy for both boys and girls as we move forward with a new 2030 sustainable development agenda. Find out more about this day by going here and here. Share the International Literacy Day poster, located here. Find out more about where your country and others stand in terms of literacy by accessing UNESCO’s eAtlas of Literacy, here. Jamaica’s first public gay pride event a symbol of change: ‘It felt liberating’. Early August is a special time for Jamaicans. The Emancipendence holidays celebrate both the end of slavery in 1838 and the country’s break away from British colonial rule in 1962. But this year has seen a very different kind of symbolic even, one that for LGBT campaigners in the country marks an equally important moment in the future development of this young nation. Helping girls stay in the game [Jamaica]. “Find a trusted person to talk to about sexual and reproductive health issues, abuse and discrimination,” Sashauna Morgan told a group of young athletes at Titchfield High School, in Portland, Jamaica. The girls, netball players, were being counseled to use the skills they had developed in sports – leadership, goal-setting and good judgment – to make responsible choices for their health and futures. Tanzania begins push to reduce maternal deaths. The government together with Tanzania Communication and Development Centre (TCDC), has launched the second phase of a campaign to reduce maternal deaths and meet the fourth target of the Millennium Development Goals (MGDs). Ebola prompts efforts to boost condom use in Liberia. “I am HIV-positive, and I am sure I acquired the virus through sexual contact,” said Stephen McGill, of the group Stop AIDS in Liberia, at the launch of a campaign promoting condom use. The recent Ebola outbreak has dramatically underscored the importance of condoms in preventing sexually transmitted infections. The campaign, launched by UNFPA and partners, aims to reach 1.5 million Liberians with condoms and related information. Insight: Constitutional Court fails to give girls better protection [Indonesia]. The judicial review of the proposed change to the marriageable age stated in Article 7(1) of the 1974 Marriage Law, which was filed by the Women’s Health Foundation (YayasanKesehatanPerempuan or YKP) and, separately, by a coalition of five concerned women and children’s rights activists and organizations, came to an end on Thursday. Law guaranteeing women in the Philippines access to free birth control marred by red tape. The Philippines’ controversial Reproductive Health law guarantees Filipino women universal free access to birth control, but multiple obstacles are preventing women from accessing it. Driving the passage of the law is an epidemic of young mothers in the Southeast Asian country: teenage pregnancy has more than doubled in the past decade, and 10 percent of Filipino teenagers are now pregnant or mothers. But in many cases local governments don’t have the budget to supply the contraceptives, and even when they do many doctors and administrators refuse to distribute the drugs on religious grounds. Ukraine HIV travel ban: Kiev lifts restrictions for HIV-positive people. Ukraine announced Wednesday it has lifted its ban on entry and foreign travel for HIV-positive people, Agence France Presse reported. The former Soviet-ruled state hopes the policy change will help improve its relations with Europe.